How Deep Is Your Autoresponder? The first time you set up your email autoresponder, it can be a pretty daunting challenge… How many emails do I schedule? How do I send them out? What do I mail my subscribers? What typically happens is you write a few emails, set up your landing page, and tell yourself that you’ll be back in a few days to keep writing. Will you, though? Most people set up between 4 to 7 autoresponder messages and they call it good. Those autoresponders might have a point – they might have a theme – but oftentimes… They don’t. They don’t let your prospects explore you or your business. They don’t let your leads ‘discover’ your offers. They simply direct them throughout the site a little bit and then let them go on their way. Now, I’ve been working online for 11 years now. Admittedly, it took me almost 6 of those years to grasp this concept. As the saying goes, “Hindsight is 20/20.” If I only knew then what I know now my path might not have been nearly as rocky. You see, Scriptly has 72 days worth of email already loaded up for prospects. Curately has 46 days. TimeSlots has 60 days. Depending on where someone comes into our process, we don’t need to think about what they’re receiving from us for almost 2 months. What they work through is a structured process, filled with lead magnets, blog content, sales pages, automated webinars; and everything in between. It’s a brilliant process and it assumes nothing. Sometimes, new members will join on Day 1. Other times, they’ll join on Day 48. More often than not though, they’ll join AFTER Day 7. That means, if we stopped at 6 days of email – we’d be out a ton of sales! These are just the numbers we see for our SAAS platforms. Your offers might be different. You might get Day 0 conversions from paid traffic. You might see Day 60 conversions. Or, you might not see conversions at all. The point of building an email list is to leverage your ad spend in a way that grows your business over the long term. You’re not dumping money into direct-link ads without building an asset… That asset being your email list. When you want to launch something new? Write a few emails and click send. When you need to get some ideas about your next offer? Write a few emails and click send. If you’d like help writing your email copy, make sure you check out Scriptly’s Autoresponder Engine. There are 28+ complete autoresponder campaigns already loaded up for you there, and you can start for free! Hey, what’s up? This is Jason Drohn. Today I want to talk real quick about setting up your autoresponder the right way the first time. 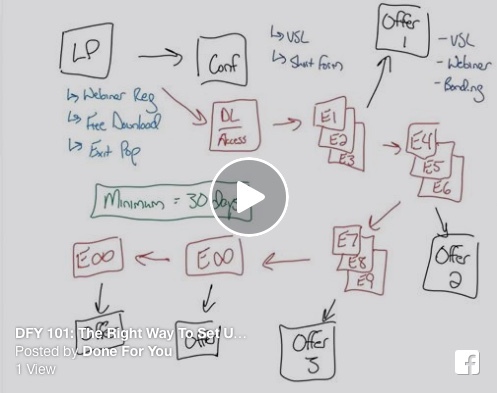 Now I’m going to walk you through what is normally done, and normally pretty ineffective and I’m going to show you a slightly different way of setting it up so that your marketing on autopilot, you’re marketing to your prospects and letting them discover you and your business and your brand. So we’re going to cover that on the screen here. Now this process is pretty simple. It’s pretty straight forward. It walks through the beginning to end for the most part. And if you implement what I’m about to show you, you should have at least 30 days worth of email copy. So normally what happens is you set up a landing page, you’re told the money is in the list and it’s important for you to have a list and grow a list. So you set up a landing page and that landing page usually gives away some sort of lead magnet. Well when somebody opts in for your landing page, they’re sent to a confirmation or a download page, and from a site standpoint, that’s really pretty much the last time your prospects come back to your site. Now email goes a different way, so you send, the physical browser, you send the user to your website or to lead pages or click funnels or whatever and they get their download and then your email goes out to them and then they are also sent a link in that first email. Then from there, usually you set up email one. Then you go set up email two, email three, and email four. So most autoresponder sequences, there are no more than five emails, six emails. We’ve been working with a lot of clients for a lot of years and four or five emails is typical. So the problem is, or the challenge I should say is that prospects don’t usually convert in five days or six days. Sometimes prospects convert in ten days or 14 days or 20 days or 30 days. It’s really difficult to gauge when a prospect is going to convert into a sale. Now, normally those sales, normally a things that are in those emails. Email one, email two, email three and email four, are affiliate offers, internal offers, internals offers being offers that you control, you maintain, so you have the sales copy and all that other stuff. Other people have termed a series called the indoctrination series, so it’s getting people use to and accepting and in your brand and your offers. Now, and then there’s the bonding sequence, you know, so showing somebody around the website or showing somebody around social media profiles or platforms so that they learn a little more about you, so they learn about what you do. Now there’s no doubt about it this way where we have a lead magnet and a couple of emails and whatever, there’s no doubt about that that’s the easy way of setting it up an autoresponder. The problem is especially when you turn around and you want to start buying traffic’s, you want to start paying per click or you want to start paying per lead or whatever. When you turn around and start buying traffic, you’re not going to be able, rarely going to be able to get that to ROI that four or five email sequence. So what I’m going to show you now is a 30 day email sequence that isn’t a whole lot harder to pull off. In fact, in some ways it’s easier, because you have a very good idea. If you follow the rest of this video, you have a really good idea about how to set it all up. But this sequence is meant to keep your prospects warm for at least 30 days. You know, not even warm but like red hot where they’re coming and buying your stuff. So we started the same way. We start with the landing page and that landing page is a Webinar registration page. It is a free download page, lead magnet. So you’re giving away a report or a checklist or a case study or a swipe copy or a swipe file or whatever, but you’re giving away a free download. And the third way that we consider exit pops, to be a landing page because if somebody is on your website and then they go to leave, we’ve gotten 20-25% conversions from an exit pop without even batting an eye. So they’re super effective for if you’re doing native advertising and driving traffic to content, you can throw an exit pop up and still be able to retain a lot of those visitors. Now after somebody signs up for your landing page, then they go to your confirmation page, very similar to what we talked about previously, but they go to a thank you page and on that thank you page rather than there just being a download, you have a video sales letter or you have a short form sales letter meant to move them in terms of, you know, they’re thinking men to move them from just, you know, downloading something for free, receiving that thing and then ultimately buying whatever it is you’re offering. So if you have a report on, I dunno, let’s take Scriptly for instance, if you have a report on the 100 best performing subject lines and then you offer to write their emails, you offer free access to a piece of software that writes their emails for them, then you’re, you better believe that that conversion is going to be pretty high. Now after somebody goes through the thank you page, goes through, they sign up for the lead magnet, they get the confirmation, they are shown an offer. Then the first email they get, which is in red on your screen. So the first email they get is the download or the access email and that’s where we actually provide the PDF that they downloaded. But then we take a slightly different route. In the previous example, we had four emails that just kind of, some of them were indoctrination, some of them are offers or whatever. But what we do is we like to group emails together in three or four emails and promote one thing. So in this case we’re going to promote one offer and that offer is going to be what’s responsible for about 80% of the revenue that this campaign generates. Then from there we send email four, email five and email six. So we again, group another three emails together and we’re promoting the second offer in the sequence. So they download the report, they get their access and then we send a chunk of three emails promoting offer one. Then we take a day off, sometimes two days off, and we send another chunk of three emails promoting offer two. Then we take a day or another two days off and we send another group of three emails promoting offer three. Now these offers don’t all have to be something you retain or something you control. They can be blog posts, they can be affiliate products, they can be physical offers on Amazon, they can be books, they can be, you know, webinars. But the point is we want to send a targeted group of emails to the prospect list so that they do something. Then, after email nine we continue sending emails, be continue sending those out to the prospect list and overall we just keep rocking that way, we just keep going that direction. So in might not necessarily be every day we send emails we might send to a blog post, we might send to a Webinar, we might send to a YouTube video hosted on YouTube, but we want to make sure that we continue sending offers out to the list. The moment you take seven days off from your email list and they’re not receiving any emails from you, then they’re going to start going cold and they’re going to start forgetting who you are, which is terrible because you work so hard to build that list. Now the minimum for any autoresponder, should really be 30 days, 30 days is the absolute bare minimum in order for you to start generating some good repeatable revenue from that list. And it’s doubly true if you’re paying for traffic. So if you’re paying for traffic and you’re spending $3 per new lead, per new webinar registration that signs up, hits your list, then you need to make sure that that cash is liquidated, you know, so that you can pay for more traffic. Now the offers in themselves, they can be a video sales letters, they can be webinars, they can be part of a bonding sequence. You know, you can be sending them to blog posts and social media accounts and whatnot. But the point is you want to make sure that they stay engaged, that they stay active throughout the whole process. So hopefully just by kind of drawing the autoresponder setup process out, you’re able to, you know, visualize it a little bit, interpret it a little bit, make it your own. So if you have any questions at all, make sure to leave a comment below this video, inside Scriptly, we have 28 autoresponder sequences, which are really going to help you put this together, because most of the hard work, 90% of the copies already going to be written. You just have to go through and tweak it and edit it. So Scriptly.org and sign up for a free account there. Also, if you want to talk to us about setting something like this up for you, just go to doneforyou.com and right at the top of the screen, you’ll see a start project button. Go ahead and hit that button, follow through the process. You’ll get on the phone with me and we will take a look at what you’re doing. What you’re selling what your offers are, what your business is all about, and you know, we might be able to build something out for you.